Whitepaper proves the value of KPIs for construction company decision-makers. If business data is good, then more business data must be better….right? Wrong! Too many construction companies are so busy crunching numbers and generating reports that they don’t have time to focus on what this data really means for their business. Don’t even go there. Instead, learn which key performance indicators (KPIs) matter most—and how to start tracking them—in a new whitepaper from Acumatica. 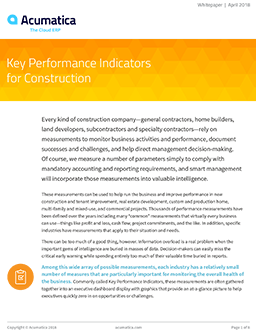 Which KPIs for construction to track—and which to ignore. Why predictive KPIs are the wave of the future. Four essential KPIs for construction company decision-makers. The ideal number of KPIs your business should be tracking. How to systematize your KPI process. You’re just seconds away from streamlining and enhancing your construction company’s data analysis processes. Don’t miss this chance to get better insight with less work! This whitepaper is provided by Acumatica, a leading provider of cloud business management software that gives mid-sized customers a complete, real-time view of their businesses—anytime, anywhere. Small and medium-sized businesses need to automate business management processes to grow their businesses. Acumatica’s ERP 5.0 gives SMBs a flexible and scalable way to manage core business processes more effectively and efficiently. The release of Acumatica ERP 5.3 gives users an even better experience, with a faster user interface and expanded mobility features that make it quicker and easier to get their jobs done.